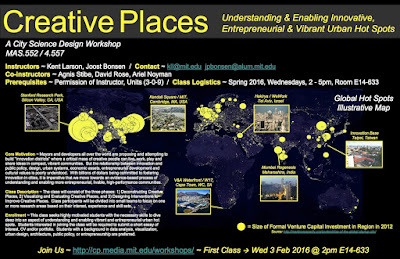 I'm co-teaching Creative Places class this Spring 2016 together with MIT Media Lab colleague Kent Larson and team, starting Wednesday, 3 February at 2pm, as part of our MIT Cities Initiative. We're particularly keen on understanding and enabling innovation, entrepreneurship, and creative vitality in cities. We seek better indices (or rankings or scores) and analyses especially of important but often intangible aspects of the city. Ultimately we aspire to deep understanding of how urban attractiveness can be best achieved through design, zoning, development, and more. Join us at first class Wed afternoon 2pm February 4th, 2016 in Media Lab E14-633.